Ranked number one in the world, Austrian manufacturer REMUS is ahead of the game with their top of the line exhaust systems. At REMUS, an exhaust is not simply built and put on the market. Each setup is rigorously tested not just for optimum performance, but for the highest quality sound attainable. If they are not perfect, the system is re-engineered and tested until the perfect balance between performance and sound is achieved. 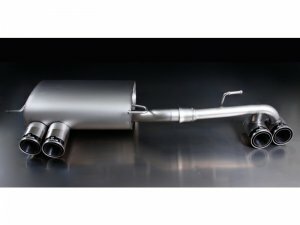 Every REMUS exhaust system is crafted from only the finest Titanium and steel, giving it the durability necessary to stand up to the rigors of various driving styles.